Do I really have to use two hooks to hang this? The fact is, if you approach it right, using two fasteners insures a more secure hanging for larger pieces, and it isn’t all that difficult. It also eliminates the “pendulum swing” effect when you’re wiping the glass from side to side while cleaning. To minimize the chance for errors, we always encourage the use of a paper template to help you accurately place your fasteners the first time. This also eliminates the need for you to lift and maneuver a heavy object while trying to establish the best place for it on the wall. 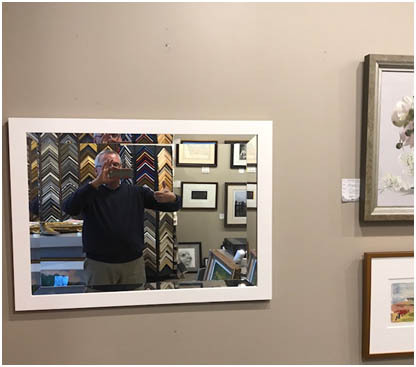 After all, moving a piece of paper around to different positions on a wall is a lot easier than lugging an 80 pound “something” around! Establish the outside dimension of your frame. Measure and note the position of the D-rings on the back of your frame. 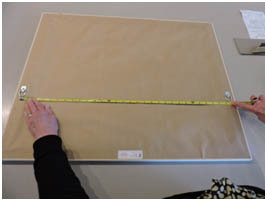 Cut (or piece-together) a piece of paper to the same size you just measured. 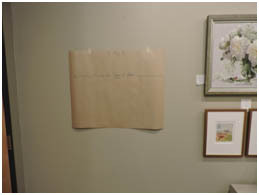 If you don’t have access to paper that size – stop in to the Gallery and we’ll be happy to provide you with some! 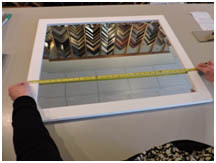 Mark the paper at the exact locations of the two D-Rings you just measured on the back of your frame. Then, use a nail to puncture a small hole in the paper at those spots. 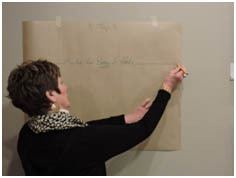 Using painter’s tape, temporarily position the paper on the wall where you think you would like it. Step back; observe; call your spouse or co-conspirator in to give an opinion (this also spreads the liability if the piece is later determined to be ill-placed! 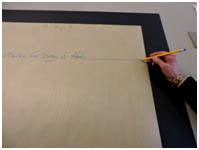 ); adjust the height and/or lateral position to suit; then, mark the wall with a pencil at the holes you placed in the paper earlier. 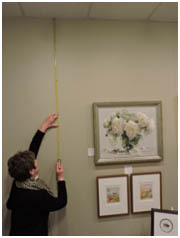 Remove paper from wall and check for “level” of your two pencil marks by measuring from the ceiling down to each mark, and adjust as necessary to make this distance the same. 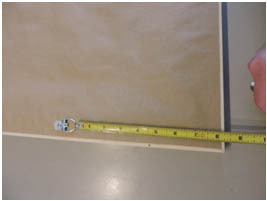 A carpenter’s level can also be used to check for “level”. 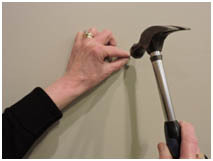 Once your marks are equidistant from the ceiling, attach your fasteners/hooks at the marks you placed on the wall. 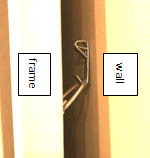 Position your frame on wall by looping the D-Rings over the fasteners.